Provencal apron is Grandma's, the pinkish one is mine. No recipe today but a little story or two. The weather is so bad I have been struggling with my photo session this morning so I gave up and give you a little post about a couple of things: aprons and your own Italian Chef. Ilva, from Lucullian Delights asked food bloggers everywhere to show her their apron. When I was taking picutres of mine and explained to B. what I was doing, he had that look on his face "Weirdos..." Well, at least she did not ask us to show our feet or naked selves....! I could not post about just one apron. There is the one I use almost everyday and the one that I keep in a kitchen drawer, much like a good luck charm. The blue and yellow provencal inspired apron in the picture above belonged to my Grandmother Paulette. If you have been reading this site for some time, you know how important she was to me. I credit my love of anything sweet and kitchen related to my grandmother. Her kitchen was constantly in action and very much the place where all of us would gather and chat. She had a collection of aprons that would make any women jealous, rugged or pristine, lived in or barely worn. When she passed away, my mom and aunt were in charge of organizing her closets and going through all of her little things (gosh, the woman kept everything). They were going through piles and piles of clothes and other utilitary items that my grandfather could not bear to see anymore and that would be of better use to other women. I know how hard it had to be for them to do this, but there was no point in keeping all that stuff in closets and boxes. They aked my two cousins and me (we are just months apart) if there was anything of Grandma that we wanted as a souvenir, like a scarf or a handkerchief. We all replied at the same time: "one of her aprons!" This is how we knew and remember her, presiding the kitchen, making things happen behind the scene. I don't even know if she enjoyed cooking that much, we never talked about it, she was just good at it. That provencal apron is interesting to me for a couple of reasons. No matter what I cook in the kitchen, everytime I take it out to look at it, I can't help but smell it....and even if I am making a curry or a tagine, it still smells like her, even after all these years. On one of the pictures you can notice a safety pin, close to the top. This is quite funny to me because she would use a safety pins on the ones that were broken at the neck part and kept using them like that. This one, although worn and faded, is not broken, yet she had attached a safety pin to it, as if she knew it would break eventually. Can't really tell how long she had it before she passed away, but from the look of the other ones, this one was either relatively new or well taken care of for unknown reasons. I can't wear it though. I am afraid of messing it up and it is hers. It's got her fit, her smell, her touch, safety pin and all. The other apron is mine. I don't do full length aprons like Grandma. As soon as I started working in a restaurant, I did what 99% of the other chefs did, wear mine as a half apron. Top part folded underneath, ties wrapped around twice and knotted in the front, knot folded on itself so it does not catch on anything you are working on. At the house I do the same with the few aprons that I have. Recenty I started looking into making my own with large kitchen towels, that I would turn into half aprons. I had seen a couple of crafting sites withe the project explained, seemed easy enough, but what can I say...after work, baking, and playing I don't have much time left for sewing. I turned to my trusted Etsy site and found a great gal, Rebecca, who was making fabulous ones, exactly like I wanted, with great colors and patterns. Just a few days after ordering I was able to play it very mod in my own kitchen. I only have this one from her, but believe me, she has not heard the last of me!! As for the Italian Chef? Lisa posted her account of the fabulous 5 days we spent together. I just want to add a few things, or at least my own memory of it! - the look at the airport: I was just amazed they were pulling in as soon as I had gotten my luggage. Perfect timing, and less time to spend outside with weirdos! - the dogs: I did not want Chloe to smell my dog and bark at me. Lisa's pupps are just adorable, loving and all over the place! - friday night liquor consumption: well, that was pretty much Hubbs and sister. I went to bed shortly after Lisa, but kept hearing them laughing so I went back to the kitchen and talked while they were getting cozy with the booze...I had water...really. - I had only one s'mores,(but plenty of roasted marshmallows) I coud have had 3 but I was trying to behave and not show the glutton in me!! - Sur La Table: I agree that store is evil....everytime I was picking somethig up I was thinking B. would have a fit...except for the glasses, he had "ordered" me to get her something nice and if a woman says "I covet them", well, you just got to get it!! - cooking: oh yeah, we took our time but when I think of all the stuff we did in 2 days, I am very happy! And that tomato sauce....I am having it everyday, with everything! No more jarred!! The meatballs, well, let's just say I scored really high with B....!! - her husband is the sweetest man ever. He adores her and clearly worships the ground she walks on....now, if he could only teach mine how to cook!! - she learned that keeping me up late at night meant feeding me more and more and more....! - do not believe her about the macarons: I only helped with the piping, the rest is hers! - if I could I would find a way for us to be neighbors. From the moment we met, there was no awckard silence, no strange moment of adjustment. We trusted each other and showed good, the bad and the ugly. Lisa has the biggest heart ever, and the knack for saying the right things at the right time. Her patience is beyond words and her 'joie de vivre' is contagious! Stay tuned as we planned a little guest posts on our blogs. I'll visit hers for a ratatouille dish, and she'll come over here for her macaron adventure. If only we could do it again soon. Hopefully they can visit here soon! Thanks Lisa for everything. I was able to relax, take some time to reflect on the past few months and really have a good time. You are the most gracious host. 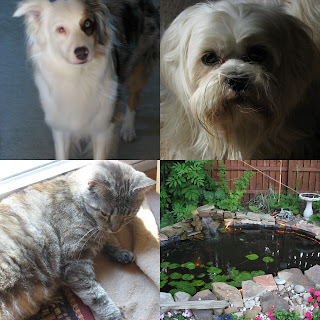 Lisa's little family: Chloe the Australian Shepherd (my dog would totally make out with her), Nigel the Lhassa Apso (reminded me so much of my previous dog a black Lhassa ), and Wicked the Cat of more than 9 lives, and the pond where we relaxed a lot. Thanks Helene! It's so nice with aprons with a story and I think your grandma probably is happy about your choice of item to remember her by! And I just knew you would have a great time with Lis! You didn't drink with them? HAHAHAHAAAA! I thought you had and I just hoped you had fun and that my sister wouldn't embarrass me too much! har! Did you get the title to my post? You really need to share that lil story with everyone - was so great! I'm a new reader on the blog so I totally enjoyed the grandmother story. When my mother died, we asked her grandchildren what they might like from her household and the kitchen items were high on everyone's list. My daughter specifically requested a cookie sheet. She now uses it regularly in her kitchen and feels her grandmother's presence. She also says that cookies baked on Grandma's cookie sheet always taste the best. Just like your lovely aprons, these are things that make our kitchens so much fun. What a beautiful story about your grandmother. Your aprons are lovely! Can't wait for those guest posts! 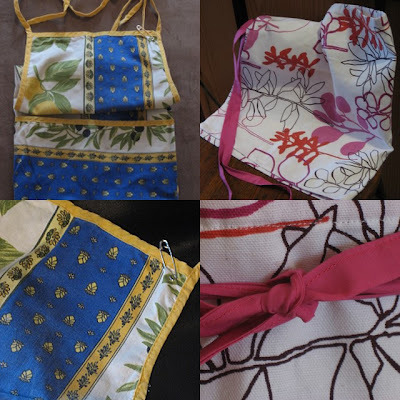 Thanks for sharing this story, Helen...lovely aprons! Thanks for sharing your story about your grandmother. My grandmother was a very good cook as well but she never cook with an apron. My grandfather was a paranakan so she wears a lot of sarongs and we were given one of her sarongs. Wasn't able to read through the whole of it... but scrolled through... and I must say... you have made a fabulous first impression. Helène, a lovely post. Grandmothers are.. what can I say? Mine was as fabulous as yours and I think of her almost every day, her little chair is in our bedroom, her table cloth was on our table today and her memory is in our hearts. what a wonderful story of your grandmother's apron. I'm heading off to Lisa's site to read the adventures you gals had. What a sweet story about the aprons, I recognized the Provencal pattern immediately and knew it must be a family treasure. I have to admit I rarely wear aprons, even though really I should, especially since most of my wardrobe is black (and getting flour on it)! What a great way to keep the memory of your grandmother alive and to have her right there in the kitchen with you. I've just read Lisa's account of your visit and I am happy for both of you - to be able to connect and bond. Friends forever! Thanks for sharing about your time with Lis, Helene! I loved reading both of your accounts, and it's clear that a true friendship has been just been made stronger! What a wonderful story about your grandmother!! And you both sound like you had such a good time together. 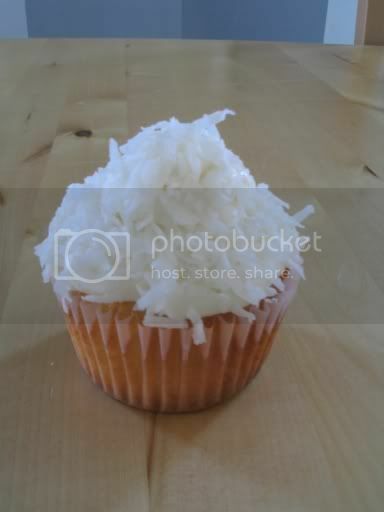 Such a lovely post, Helène. I'm glad that you decided to write about your grandmother and the time you spent with Lis. Food & cooking for me is very much about family and friends and not a solo activity. As a kid, while other kids were watching TV (this is before the internet generation), my sister & I spent a lot of time in the kitchen talking to mom, doing my homework, etc (oh, and eating of course!). Thanks for sharing your stories. I love your Gran's apron. Sounds like a wonderful visit with Lisa. I hadn't thought of my grandmother in a long time, but your story of the aprons brought so many beautiful memories flooding back. No matter what we were cooking or how many cooks were in the kitchen, Grandma always had aprons for everyone. I can smell that kitchen right now and feel the love that went into everything that she created. Their skills and love lives on in your kitchen. I have many of my Granny's and Mother's tools, a few pots, and some pans, and using them always brings to mind some rainy Saturday or a special dish. Thanks for sharing. BTW: your pix are beautiful! Love the picture of Lisa's doggies, so cute. I am glad you both had a great time. You seem like a crazy duo together, which there is nothing better than that.